The full core stage of SLS, which includes a liquid oxygen tank, will measure 212 feet (65 meters) tall and have a diameter of 27.6 feet (8.4 meters). Together they will feed four RS-25 engines at the base of the rocket to produce 1.6 million pounds (7,440 kilonewtons) of thrust. 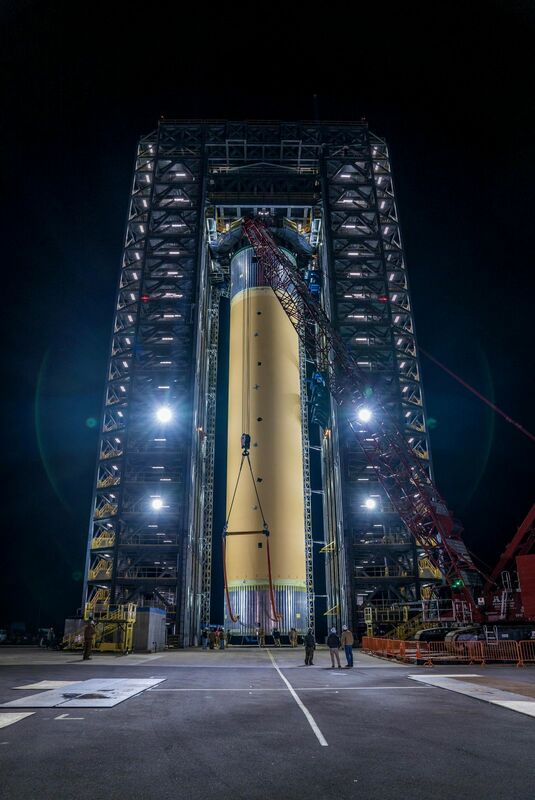 Combine that with two five-segment solid rocket boosters, the SLS is expected to have a total liftoff thrust of about 8.8 million pounds (39,400 kilonewtons). 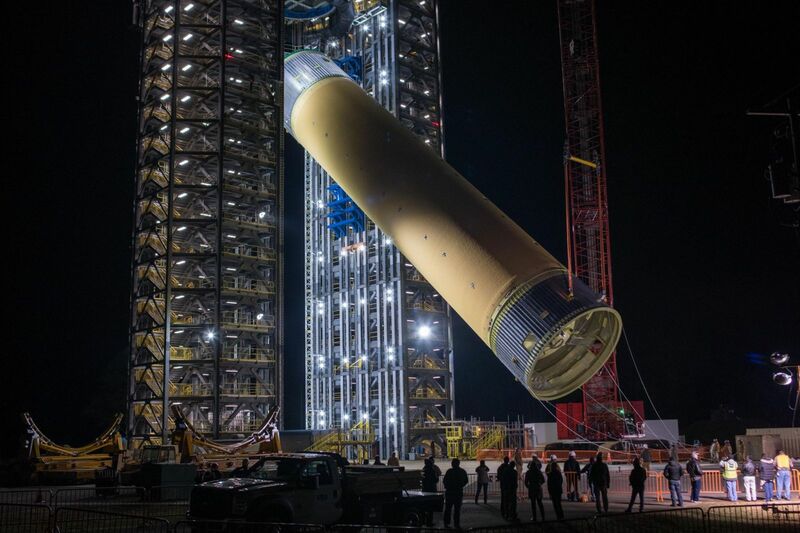 NASA said dozens of hydraulic cylinders in Test Stand 4693 will “push and pull the tank,” to subject it to stresses the core stage is expected to see during launch. As of right now, the first test flight — the uncrewed Exploration Mission 1 — is expected sometime in mid-2020. It will see an Orion spacecraft fly around the moon before coming back to Earth for a splashdown in the Ocean. Once this single flight takes place NASA can abandon SLS and move on to using Falcon Heavy. Curiously, SpaceX Starship may even proceed this single SLS launch event and return to land at the launch pad for reuse versus being discarded like SLS. A reusable spaceship, built with private funds and at a small fraction of SLS costs. An easy choice. The SLS is far more important than the grossly propellant inefficient and CO2 spewing fossil fueled SpaceX Starship/space bomber. The SLS will be used to launch reusable 130 metric ton propellant efficient 900+ Isp Nuclear Thermal Rocket upper stages that will have far greater and more useful delta-v capabilities than the overweight and low 380 Isp and limited delta-v of the Starship/space bomber. ‘Space Dominance’ and Lunar mining missions require high performance Nuclear Thermal Rocket propellant efficiency that is far beyond the inherently limited capabilities of the propellant inefficient Starship/space bomber. Why do the confused folks expect everyone to respect the propellant inefficient, slow, space radiation riskier, and overweight fossil fueled cult starship/spaceship when NASA experts want far more propellant efficient, faster, and safer nuclear thermal rocket powered spacecraft? SLS will fly once and the entire system will be discarded. Not to worry, SpaceX will be there to actually get us out of the gravity well with real technology. Not some fantasy power point system which will never be more than a pretty drawing. Both Russia and China have made plans to benefit from the excellent propellant efficiency and cost reductions that are offered by nuclear-powered spacecraft. Russians built and tested the 900+ Isp RD-0410 nuclear thermal rocket engine more than three decades ago and yet today we have a neo luddite Mars colonies soon cult trying to sell America on a grossly propellant inefficient 380 Isp SpaceX starship/space bomber. The SLS will be used to launch the international Orion spacecraft and reusable 130 metric ton solar or nuclear electric propulsion powered space tugs that will have 6 to 36+ times the propellant efficiency of the fossil fueled Falcon Heavy’s and Starship/space bomber’s respective upper stages. Do we Americans want to haul mainly useful cargo into LEO and to the Moon, asteroids, and Mars and win our Cold War II or do we instead foolishly want to mainly haul the massive amounts of low energy fossil fuel propellants that are needed for grossly propellant inefficient fossil fueled rocket propulsion systems and thus become losers in our Cold War II? The cult folks of the grossly propellant inefficient (and low 380 Isp) SpaceX starship/space bomber powered by energy weak fossil fuel rocket engines may remain confused and lost in space, but the experts at the European Space Agency (ESA) understand the critical importance of advanced space propulsion technology and highly propellant efficient solar powered electric propulsion systems to enable cost effective Lunar missions for both large and small spacecraft. The SLS can launch huge, reusable, 130 metric ton, 1,600 to 14,000+ Isp (and thus super propellant efficient and highly mission capable) nuclear or solar electric propulsion space tugs. The confused Neo-Luddite folks have babbled on about Mars colonies supported by the grossly propellant inefficient (and low 380 Isp) fossil fueled BFR/Starship/space bomber, while smart engineers in the world of commercial spacecraft building have bought into the high Isp and large propellant efficiency driven cost reductions that are gained by using various high Isp solar electric propulsion systems. Currently, Russia is working on a super high Isp (and thus super propellant efficient) nuclear powered electric propulsion system which could help to implement Russian commercial and military dominance in LEO, Cislunar Space, and on the Moon and asteroids. Nope. It can’t launch anything. It’s never flown and will likely fly only once. Boeing understands the commercial benefits of the cost effective and propellant efficient electric propulsion system on its 702SP satellite. Someday, the SLS might launch huge, reusable, 130 metric ton electric propulsion Boeing spacecraft that could efficiently haul far more cargo than the grossly propellant inefficient fossil fueled SpaceX Starship/space bomber. NASA also understands the benefits of highly propellant efficient electric propulsion systems!